Thursday, April 4, 2019 is the Plumas-Sierra Grower Day in the Mineral Room at Quincy Fairgrounds. The event will include continuing education credits for Department of Pesticide Regulation-Private Applicator Licenses and Irrigated Lands Regulatory Program. 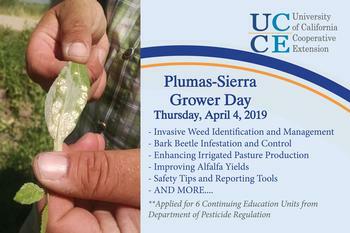 2019 Plumas Sierra Grower Day is a collaboration of the Plumas-Sierra Agricultural Commissioner and University of California Cooperative Extension. The event provides a cross section of presentations to assist local farmers, ranchers and land managers in implementing Integrated Pest Management (IPM) approaches along with identifying invasive weeds and pests. In addition, the program will include reminders of regulatory requirements and training on applicator safety. Carol will provide an update on changing regulatory requirements for agricultural producers in the region. She will also share insights to agricultural production practices in the region based on data collection. She will guide ranchers through the nitrogen management planning process for regulatory compliance and give an overview of Best Management Practices (BMP’s) for producers in the region to promote natural resource management when applying nitrogen, herbicides and pesticides on ag lands in the bicounty area. Carol is the manager of the UFRWG, a nonprofit group of agriculture interests and operators in the upper feather river watershed region including Sierra Valley, American Valley, Indian Valley, and Mohawk Valley. The group manages regulatory compliance for irrigators in the region. Tom is going to provide an overview of ecology and management of noxious weeds in the region. His presentation will focus on 3 primary weeds: Perennial Pepperweed, Scotchbroom and Cheatgrass. Tom will share integrated pest management (IPM) approaches, along with effectiveness and efficiency of chemical control options for local invasive weed control. Charlie a plant breeder and specialist in cool season forage production at UC Davis and will share with local alfalfa producers and irrigated pasture managers tips to improve production practices in the region. He will discuss pasture and range seed selection to optimize establishment and reduce long-term herbicide utilization. He will also cover water management for cool season forages to improve water quality following nitrogen, pesticide and herbicide applications. Charlie will also discuss alfalfa weevil identification and IPM strategies. Beau’s talk will focus on the role of surfactants to improve effectiveness of herbicides. He will discuss the benefits and chemical characteristics of surfactants on the market in California. Beau will also share tips on the selection of chemicals to target invasive weeds in the high sierra – right time, right product and right rate. Lastly, he will provide an overview of Personal Protective Equipment (PPS) and equipment calibration for attendees. To facilitate cross learning and an opportunity to dive in further to specific management topics, there will be facilitated group discussions. The Roundtable Discussions will provide an opportunity to share site-specific examples, discuss local challenges and provide feedback on future research and extension needs in the region. Tracy will provide a brief synopsis of CA License requirements for pesticide application and Overview of Continuing Education Requirements for licenses. She will also provide a step by step guideline for online reporting of applications. Darien will provide an update on DPR laws and regulations, with a special focus on rules regarding chemical application near schools and daycares. He will also discuss personal protective gear along with safe transportation and storage of chemicals. Attendees will have an opportunity to ask questions regarding state rules and regulations. Ryan will share an overview of Bark Beetle identification and ecology, specifically teaching attendees on early signs on infestation. He will share Integrated Pest Management (IPM) approaches and chemical control options of bark beetle. Ryan will present a case study of concerns and control of Bark Better management in California. *Agenda is subject to change as event approaches.